Fried prawns coated with salted egg yolk is another Chinese New Year favourite. This recipe was first published in Flavours. Rub the prawns with salt and sugar. Separate the salted egg yolk from the whites, and steam yolks for 5 to 7 minutes. Allow to cool, then mash with a fork and set aside. 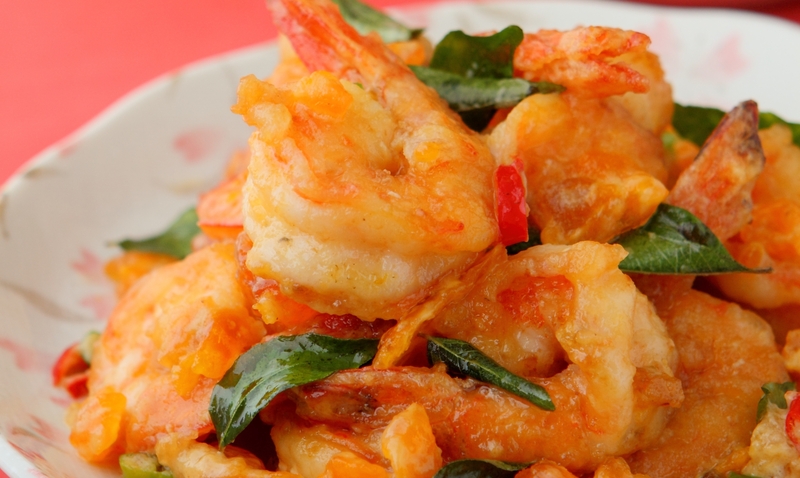 Place the tapioca flour in a bowl and toss in the marinated prawns, shaking off excess flour. Deep fry the prawns over high heat until just cooked, drain of excess oil and set aside. Place the margarine in another wok. Once it melts, toss in the egg yolks and the rest of the seasoning ingredients. Stir until the mixture becomes a paste. Then add the prawns and stir gently so that they are thoroughly coated with the paste. Remove from heat and serve immediately. I love this recipe. Will surely try to cook it myself. The menu says “shelled” prawns but not de-veined, whereas the photo shows them de-veined.